Tropical cyclones (TCs) constitute one of the major natural disasters around the world as well as an important source of fresh water over areas prone to tropical cyclones. Annually, an average of 119 million people are exposed to tropical cyclone hazards (United Nation Development Program 2004). This exposure is explained by the fact that about half of the world population is living within 200-km of a coastline, with some of the most cyclone-prone coastal domains coinciding with highly populated areas. Tropical cyclone (TC) rainfall contribution for North and Central America (NCA), South and West Asia (SWA), East Asia (EAS), East Africa (EAF), and Oceania (OCE) for 1998–2009. The tropical cyclone tracks are taken from the IBTrACS database. The TC related rainfall was identified as satellite precipitation pixels found within a 500-km radius from TC center. The TC contribution is the ratio of the TC rainfall over the total rainfall. Olivier Prat (CICS-NC) estimated the over-land rainfall contribution of tropical cyclones for basins around the world, using NOAA’s National Centers for Environmental Information (NCEI) global database IBTrACS (http://www.ncdc.noaa.gov/ibtracks/) and satellite precipitation data from the Tropical Rainfall Measuring Mission (TRMM) Multi-satellite Precipitation Analysis (TMPA). Results showed that TCs accounted for 6–10% of the annual rainfall over areas prone to cyclonic activity for the different basins (Fig. 1). East Asia (EAS) presented the higher and most constant tropical cyclone rainfall (118mm/year±19%), while East Africa (EAF) displayed the highest year-to-year variability (108mm/year±60%), and the Americas (NCA) exhibited the lowest average (65mm/year±24%). At the local scale, tropical cyclones contributed to more than 25% and up to 60% (Baja California Sur) of the average annual rainfall over very different climatic areas with arid or tropical characteristics (Fig. 1). Throughout the year, the maximum monthly contribution (8–11%) was found later in the TC season and depended on the peak of cyclonic activity, the cyclone associated rainfall, and the transition between dry and wet regimes if any. 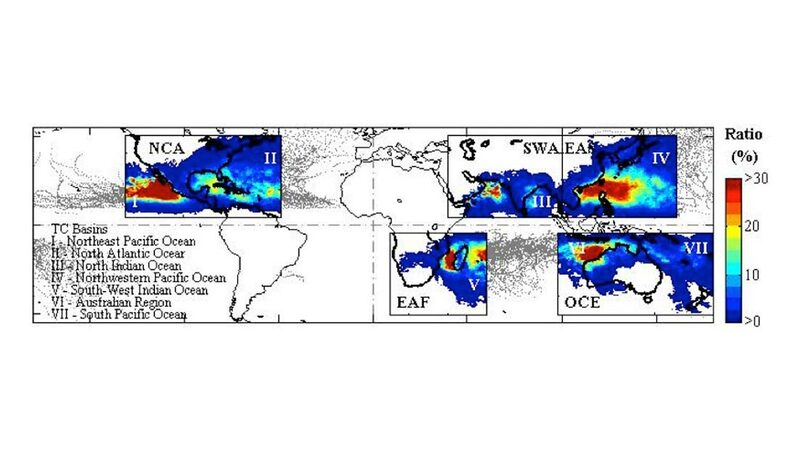 This study is the first that quantifies the tropical cyclone rainfall contribution over land for the different basins around the world. Future work will consist of quantifying precipitation extremes in relation with cyclonic activity.